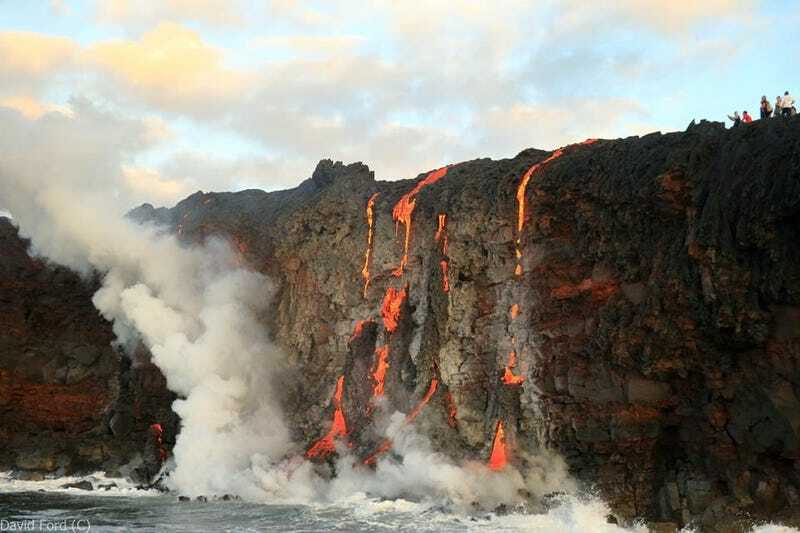 Hawaii’s Kilauea volcano has been slowly leaking lava onto the surface around it for over three decades now, but only rarely does that lava reach the island’s cliffs. This week, it finally did—and a photographer caught the whole thing from a boat. David Ford started snapping photos of the streaming lava when it first hit the ocean on Tuesday from a touring boat stationed off the coast. He’s continued to return to take more snaps of the on-going lavafall as it drops into the sea, including a particularly dramatic selection of lava-lit photos from last night. Exactly how long the lava will continue to flow off the cliff face is uncertain. Kilauea is stationed in Hawaii Volcanoes National Park and USGS officials there say that the current lava flow appears to be holding extremely steady, with no signs of either slowing or speeding. In fact, they were so sure that the oncoming lava flows didn’t pose a threat that the area actually still remains open for hikers. Although park officials wisely suggest that visitors avoid the temptation to attempt to trek the “new land” near the cliff face as it was still unstable enough that it could slide into the sea.